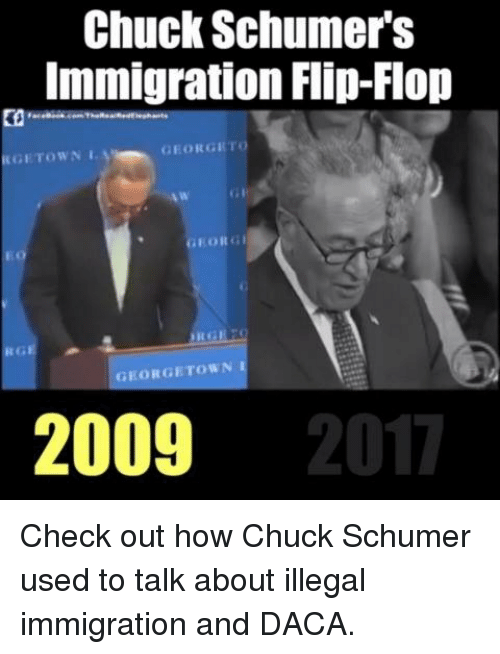 Memes, Immigration, and 🤖: Chuck Schumer's Immigration Flip-Flop KGETOWNL GEORGETO RGE GRORGETOWN 2009 2017 Check out how Chuck Schumer used to talk about illegal immigration and DACA. Check out how Chuck Schumer used to talk about illegal immigration and DACA. Life, Nationwide, and Supreme: If Democrats take back the House and the Senate in November, we can: Roll back the GOP tax scam and give meaningful tax breaks to everyday Americans Fix Obamacare and make sure every man, woman and child has access to health care * Restore DACA, stop the abuse of migrants, and set countless kids free from cages Reinstate net neutrality nationwide Put an end to Trump's idiotic trade tariffs Protect America's elections from the likes of Putin's corrupt Russian regime * Avoid wasting countless tax dollars on repainting Air-force One and a military parade Save the U.S. Supreme Court from being taken over by life-long right-wing appointees * Drain the swamp of Trump's various cronies who work for Big Business, instead of us * Help Puerto Rico recover from the incalculable damage done by Hurricane Maria * Stop the GOP from taking Social Security, Medicare and Medicaid from everyday people Prevent Big Business from destroying our natural environment for profit * And most importantly: IMPEACH TRUMP! 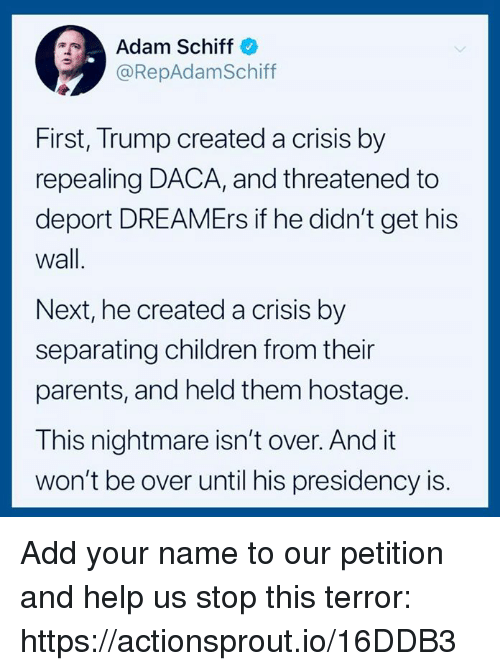 Do your part to help make this happen! Your help is crucial to saving our democracy this November! 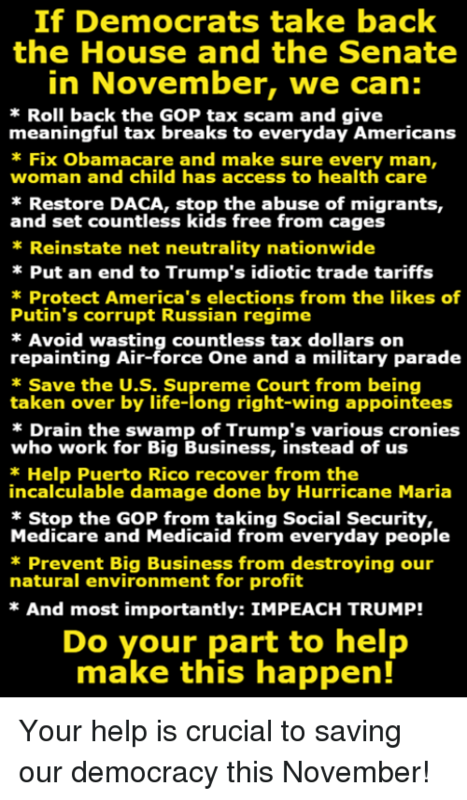 Your help is crucial to saving our democracy this November! 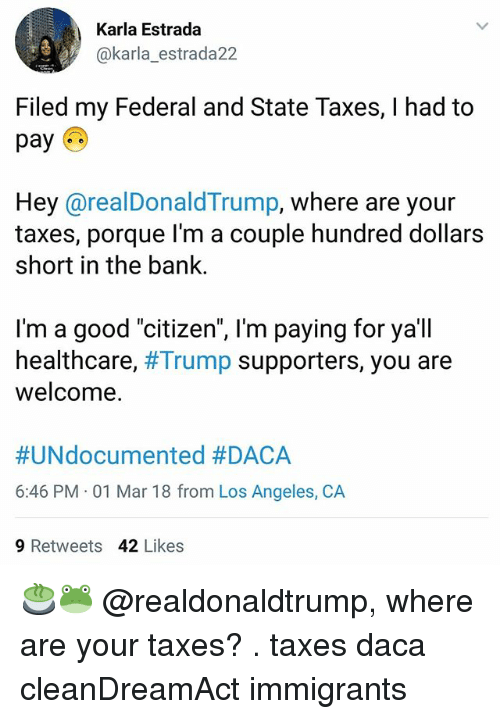 Irish, Target, and Tumblr: He nailed it I'm a DACA recipient from Sweden. 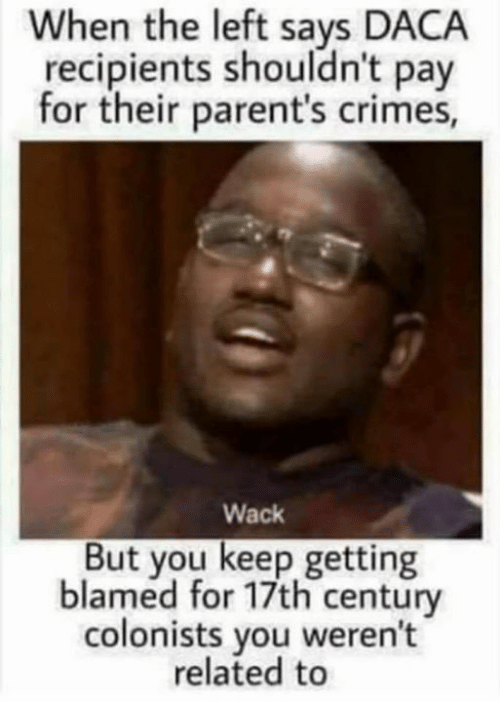 l'm 35 years old and lived in this country since I was 3. 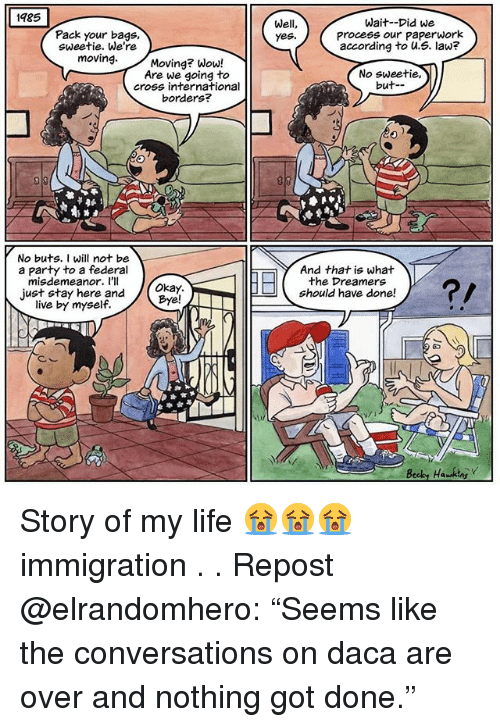 Every Trump supporter I've ever talked to thinks it's terrible what I've had to go thru in the immigration process and think I have a right to be here.. but that's because I look and sound just like them. If the color of my skin was a couple shades darker I dont believe they would feel the same. 30 minutes ago. 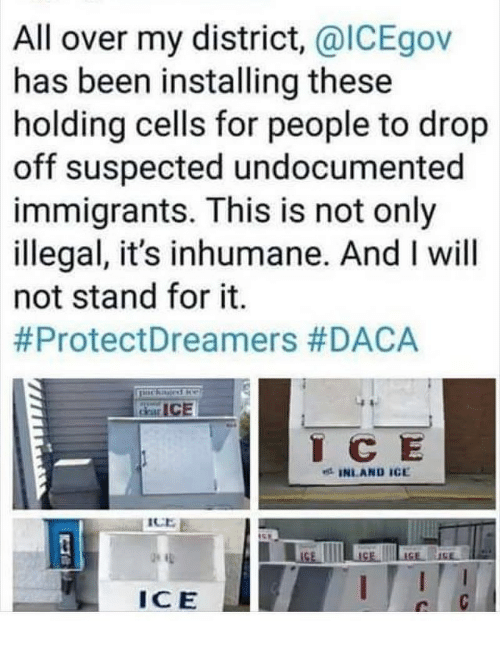 Like Reply 117 115 21 Comments hamburgerbooogie: mydadisindianajones: It’s not about “illegals stealing our jobs,” it’s about not being white. If anyone tells you otherwise they are lying. There are like 50,000 undocumented Irish nationals living in the US. 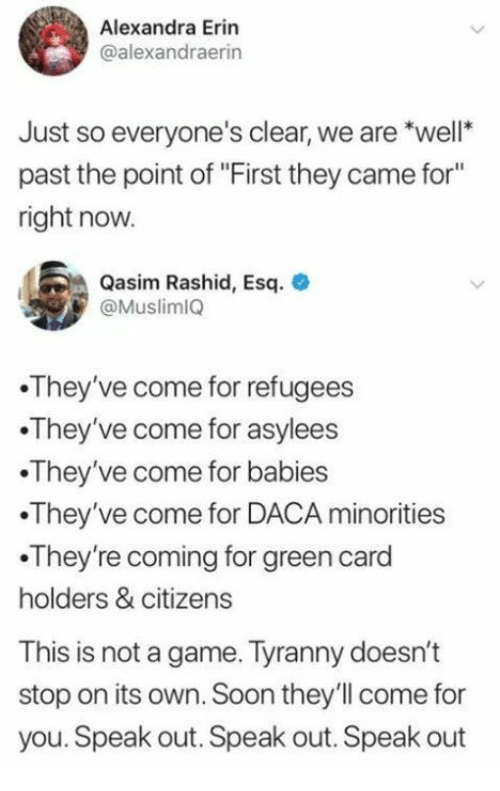 It’s not about immigration. It’s always been a race issue; they don’t want us “undesirables” here because they think we’re a stain on their lily white country. Memes, Jordan, and Office: Rep. Jim Jordan Says CongresS Should END Chain Migration BEFORE Dealing With DACA Do you agree Tell Your Congressman NO Amnesty Without ENDING Chain Migration Call YOUR Rep's office at 888-995-5219 and tell them NO Amnesty without ENDING Chain Migration. It only takes a minute. 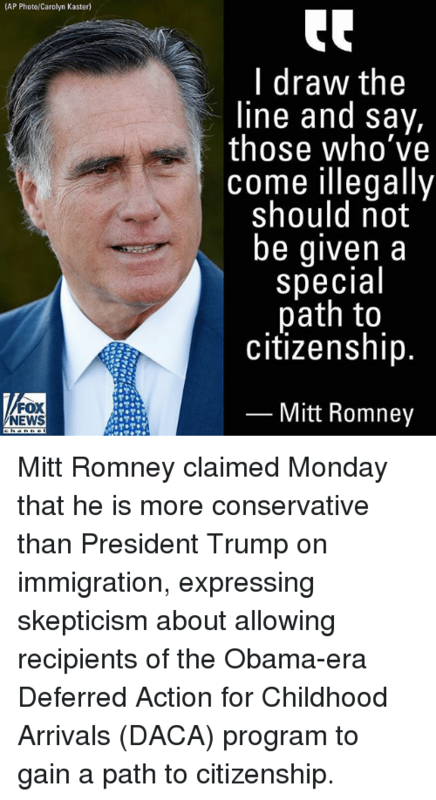 Call YOUR Rep's office at 888-995-5219 and tell them NO Amnesty without ENDING Chain Migration. It only takes a minute. Future, Memes, and Aliens: AMERICANS WANT TO CUT IMMIGRATION WHY IS CONGRESS IGNORING THEM? 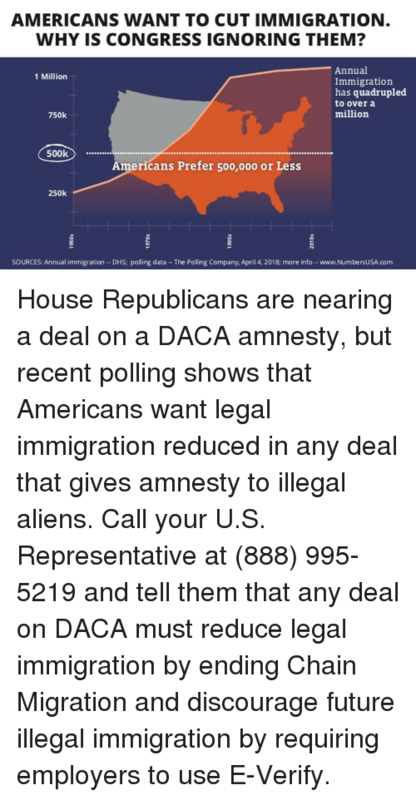 Annual Immigration has quadrupled to over a million 1 Million 750k 500k Americans Prefer 500,000 or Less 250k SOURCES: Annual immigration - DHS; polling data The Polling Company, April 4, 2018; more info -www.NumbersUSA.com House Republicans are nearing a deal on a DACA amnesty, but recent polling shows that Americans want legal immigration reduced in any deal that gives amnesty to illegal aliens. Call your U.S. Representative at (888) 995-5219 and tell them that any deal on DACA must reduce legal immigration by ending Chain Migration and discourage future illegal immigration by requiring employers to use E-Verify. Crime, Drugs, and Act: DACA is dead because the Democrats didn't care or act, and now everyone wants to get onto the DACA bandwagon... No longer works. 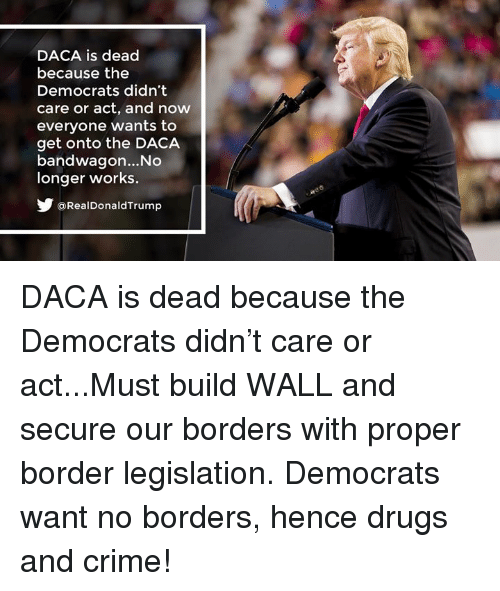 @RealDonaldTrump DACA is dead because the Democrats didn’t care or act...Must build WALL and secure our borders with proper border legislation. Democrats want no borders, hence drugs and crime! 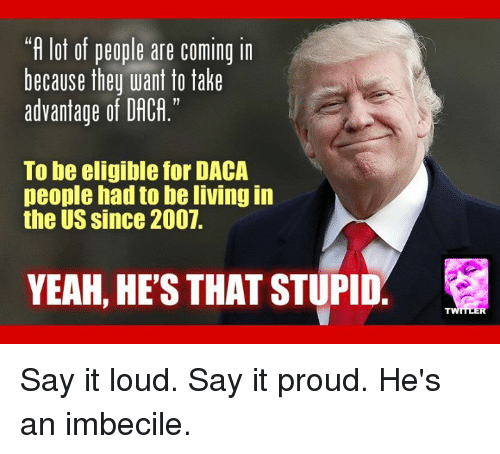 Memes, Yeah, and Say It: "fI lot of people are coming in because they want to take advantage of DACA. 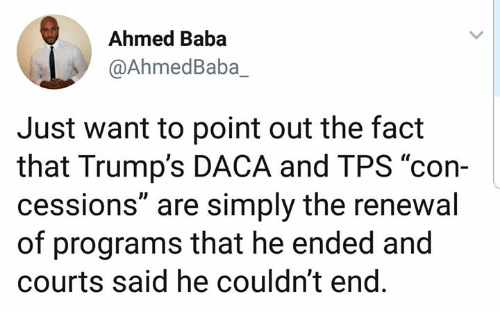 To be eligible for DACA people had to be living in the US since 2007. 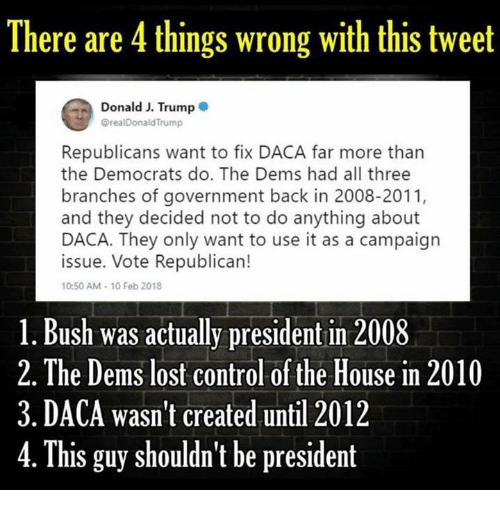 YEAH, HES THAT STUPID. Say it loud. Say it proud. He's an imbecile. Say it loud. Say it proud. He's an imbecile. Memes, News, and Obama: (AP Photo/Carolyn Kaster) I draw the line and say, those who've come illegally should not be given a special path to citizenship FOX NEWS Mitt Romney Mitt Romney claimed Monday that he is more conservative than President Trump on immigration, expressing skepticism about allowing recipients of the Obama-era Deferred Action for Childhood Arrivals (DACA) program to gain a path to citizenship. 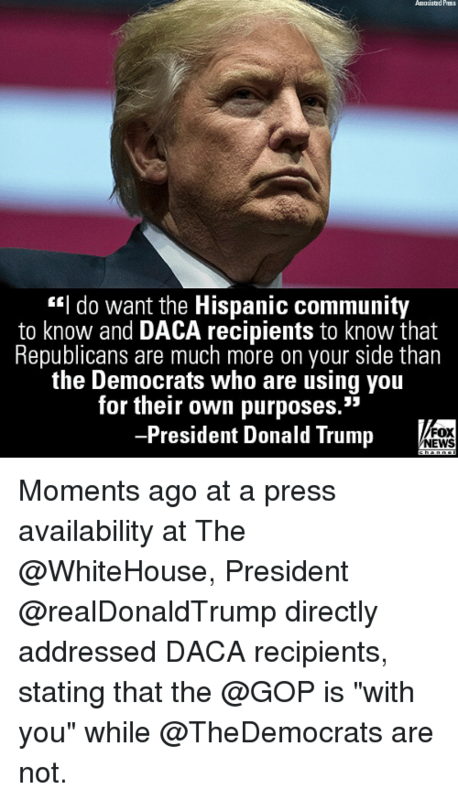 Community, Donald Trump, and Memes: Associatad Press c"l do want the Hispanic community to know and DACA recipients to know that Republicans are much more on your side than the Democrats Who are using you for their own purposes." 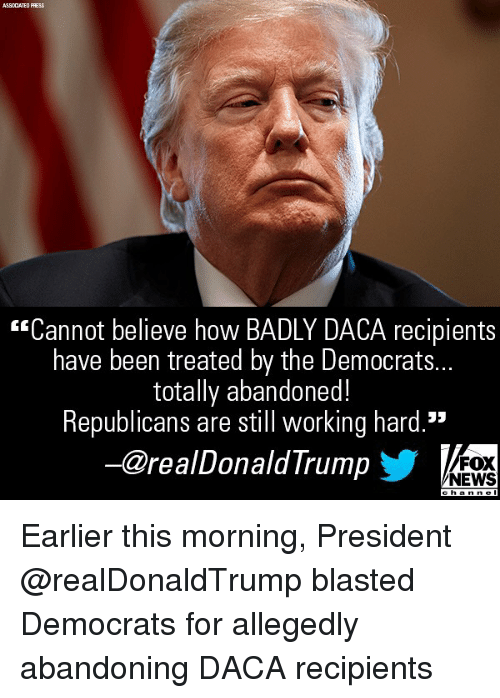 President Donald Trump FOX NEWS Moments ago at a press availability at The @WhiteHouse, President @realDonaldTrump directly addressed DACA recipients, stating that the @GOP is "with you" while @TheDemocrats are not. Memes, Money, and News: (AP Photo/Laurent Gillieron) Donald J. Trump @realDonaldTrump Got $1.6 Billion to start Wall on Southern Border, rest will be forthcoming. Most importantly, got $700 Billion to rebuild our Military, $716 Billion next year...most ever. Had to waste money on Dem giveaways in order to take care of military pay increase and new equipment. 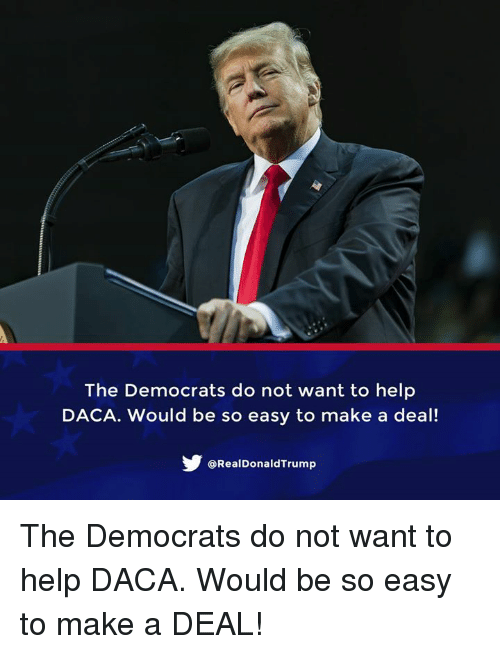 Donald J. Trump realDonaldTrump Democrats refused to take care of DACA Would have been so easy, but they just didn't care. 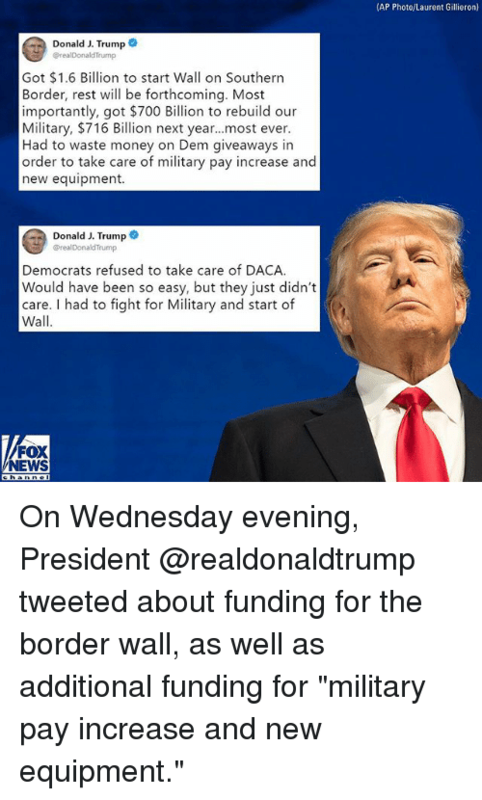 I had to fight for Military and start of Wall FOX NEWS On Wednesday evening, President @realdonaldtrump tweeted about funding for the border wall, as well as additional funding for "military pay increase and new equipment." Help, Make A, and Easy: The Democrats do not want to help DACA. Would be so easy to make a deal! 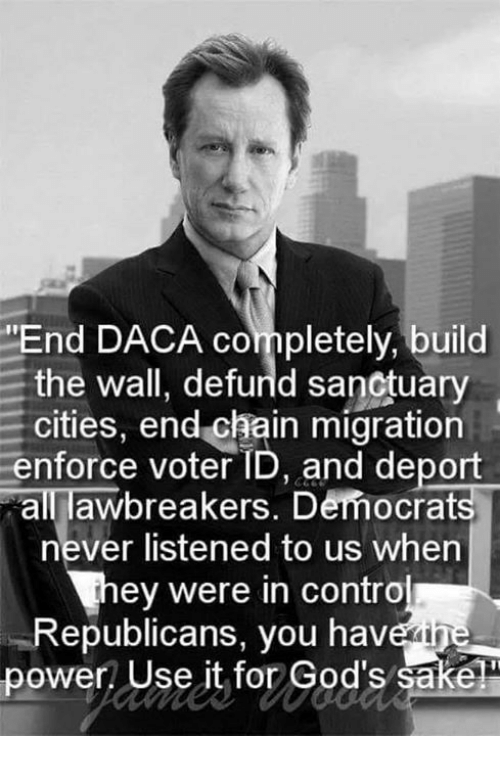 @RealDonaldTrump The Democrats do not want to help DACA. Would be so easy to make a DEAL! 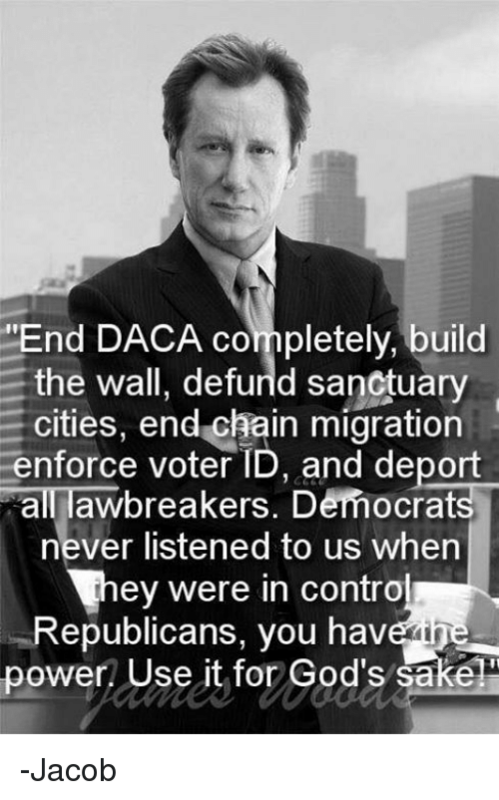 The Democrats do not want to help DACA. 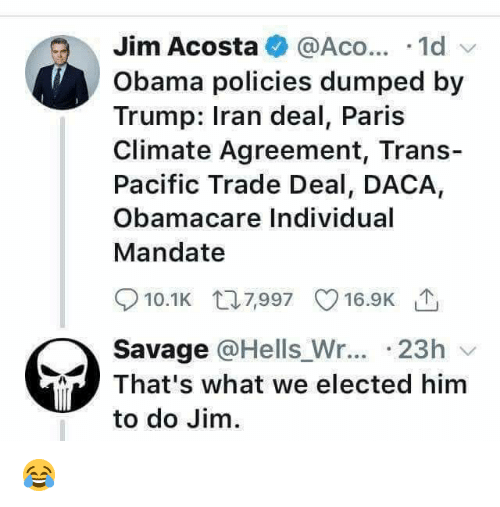 Would be so easy to make a DEAL! 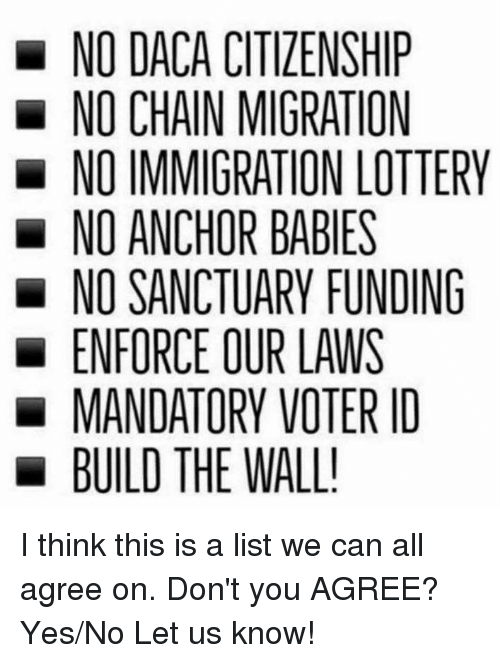 Lottery, Immigration, and Yes: NO DACA CITIZENSHIP NO CHAIN MIGRATION NO IMMIGRATION LOTTERY NO ANCHOR BABIES NO SANCTUARY FUNDING ENFORCE OUR LAWS MANDATORY VOTER ID BUILD THE WALL! I think this is a list we can all agree on. Don't you AGREE? Yes/No Let us know! I think this is a list we can all agree on. Don't you AGREE? Yes/No Let us know! 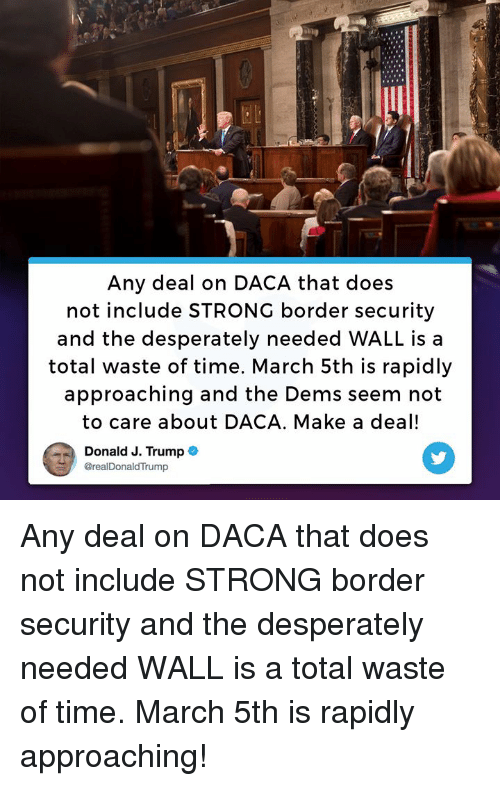 Trump, Usa, and Make A: USA It's March 5th and the Democrats are nowhere to be found on DACA. Gave them 6 months, they just don't care. Where are they? WE ARE READY TO MAKE A DEAL! 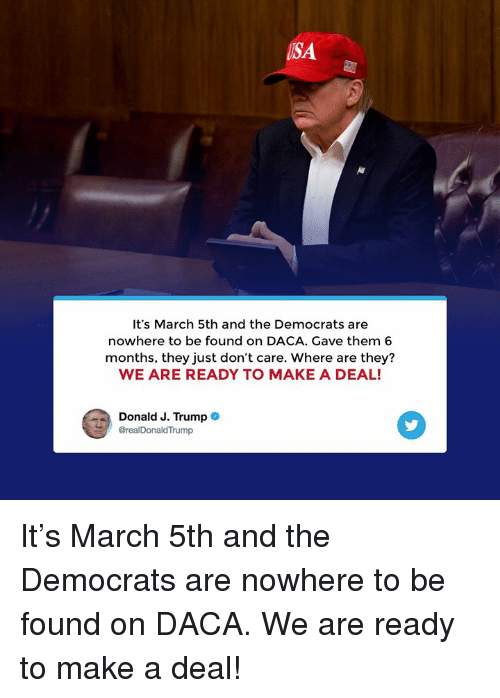 Donald J. Trump 의 @realDonaldTrump It’s March 5th and the Democrats are nowhere to be found on DACA. We are ready to make a deal! It’s March 5th and the Democrats are nowhere to be found on DACA. We are ready to make a deal! Fail, Memes, and News: ASSOCIATED PRESS FOX NEWS "Every single day we fail to protect DACA recipients is a day our country is failing an important moral test. We are running out of time. ー@KamalaHarris步 Do you agree with Sen. Kamala Harris? 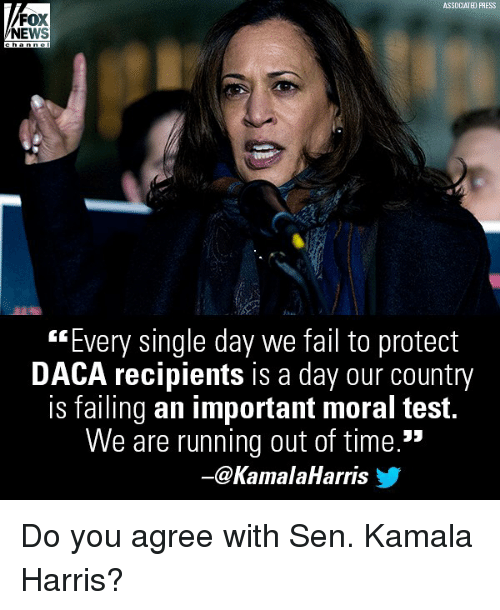 Do you agree with Sen. Kamala Harris? Taxes, Trump, and Tax: Republicans are now leading the Generic Poll, perhaps because of the popular Tax Cuts which the Dems want to take away. Actually, they want to raise your taxes, substantially. 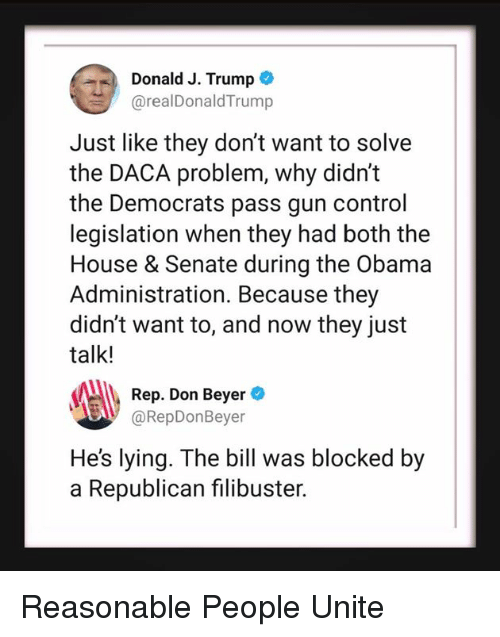 Also, they want to do nothing on DACA, R's want to fix! Donald J. Trump* @real DonaldTrump Republicans are now leading the Generic Poll, perhaps because of the popular Tax Cuts which the Dems want to take away! 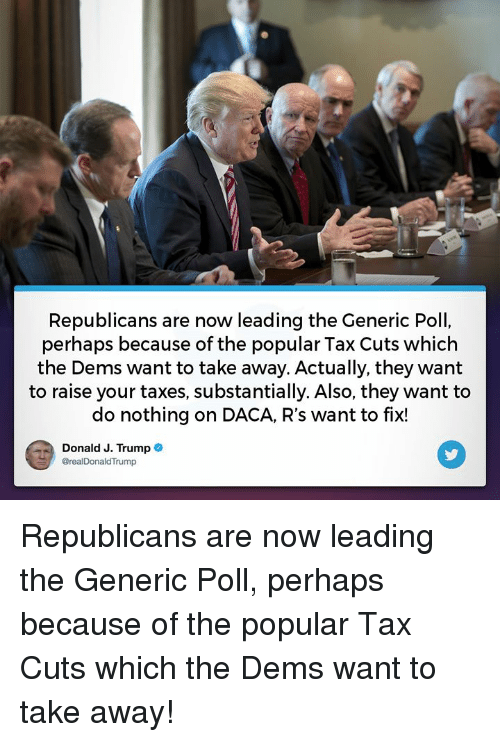 Republicans are now leading the Generic Poll, perhaps because of the popular Tax Cuts which the Dems want to take away! Memes, News, and Fox News: "The Democratic leadership have been using us [DREAMers] as pawns." 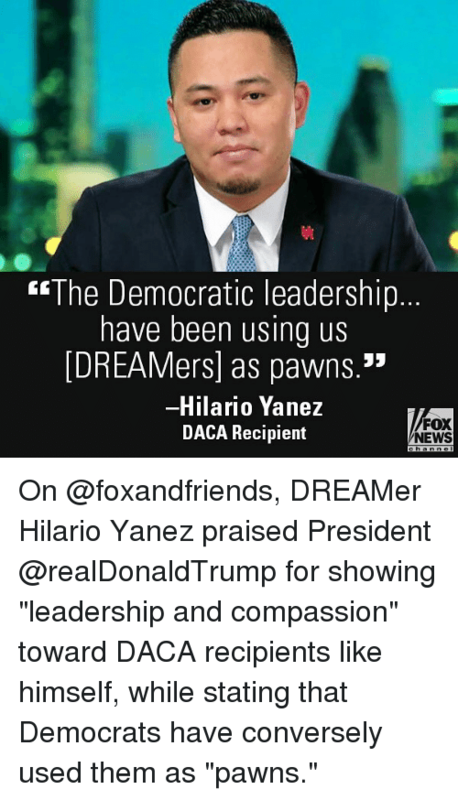 Hilario Yanez DACA Recipient FOX NEWS On @foxandfriends, DREAMer Hilario Yanez praised President @realDonaldTrump for showing "leadership and compassion" toward DACA recipients like himself, while stating that Democrats have conversely used them as "pawns." 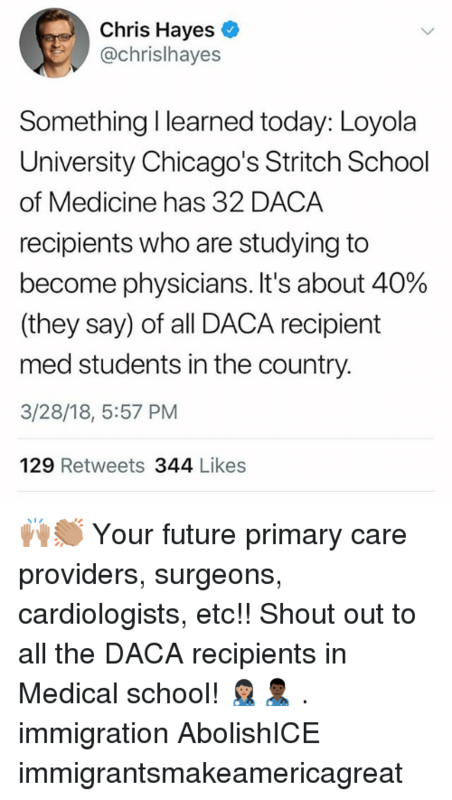 Friends, Memes, and News: ASSOCLATED PRESS l don't believe we owe DREAMers] anything. The guy who murdered my son was brought over at 3 years old. He didn't stay three years old." 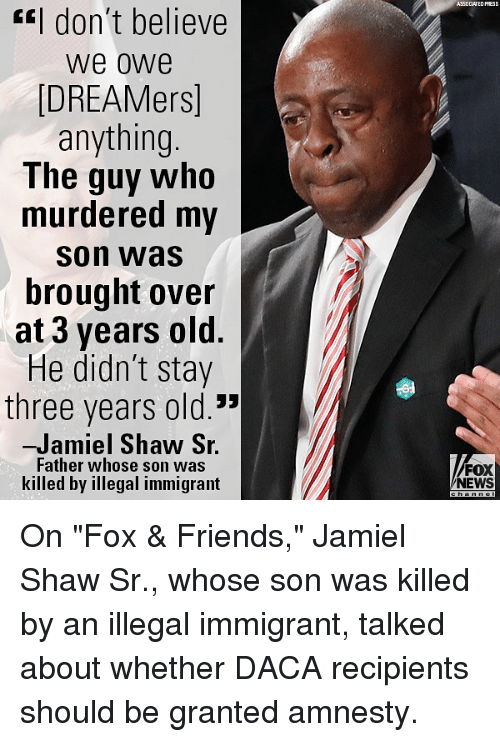 -Jamiel Shaw S. Father whose son was killed by illegal immigrant FOX NEWS On "Fox & Friends," Jamiel Shaw Sr., whose son was killed by an illegal immigrant, talked about whether DACA recipients should be granted amnesty. 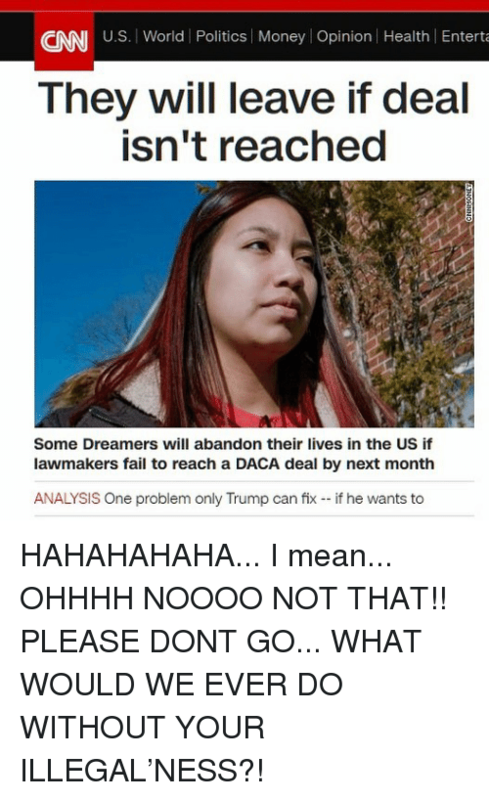 Fail, Memes, and Money: CNNI U.S. World Politics Money Opinion Health Enterta They will leave if deal isn't reached Some Dreamers will abandon their lives in the US if lawmakers fail to reach a DACA deal by next month ANALYSIS One problem only Trump can fix - if he wants to HAHAHAHAHA... 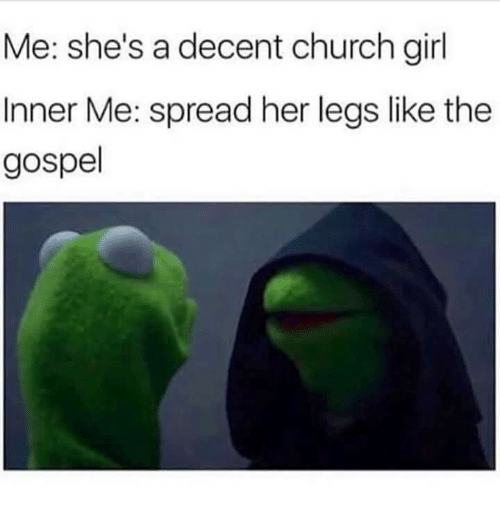 I mean... OHHHH NOOOO NOT THAT!! PLEASE DONT GO... WHAT WOULD WE EVER DO WITHOUT YOUR ILLEGAL’NESS?! HAHAHAHAHA... I mean... OHHHH NOOOO NOT THAT!! PLEASE DONT GO... WHAT WOULD WE EVER DO WITHOUT YOUR ILLEGAL’NESS?! 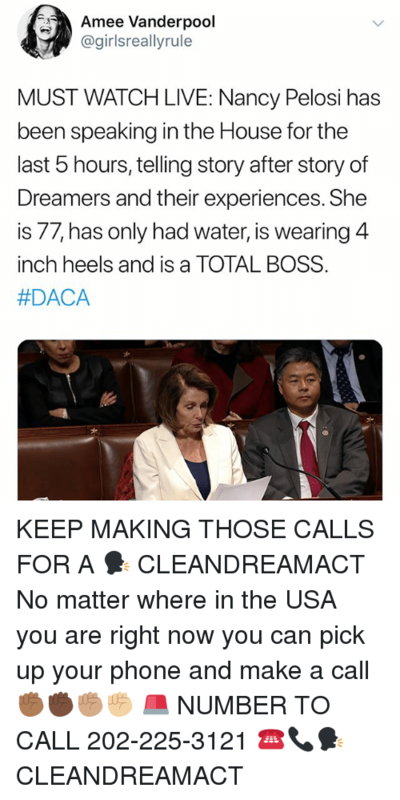 Memes, News, and Black: y Lous/Wirelmage TRUMP "Nancy Pelosi... can stand up and speak for DACA DREAMers for 8 hours yet she sat down on the fact that black unemployment is at its all-time low." 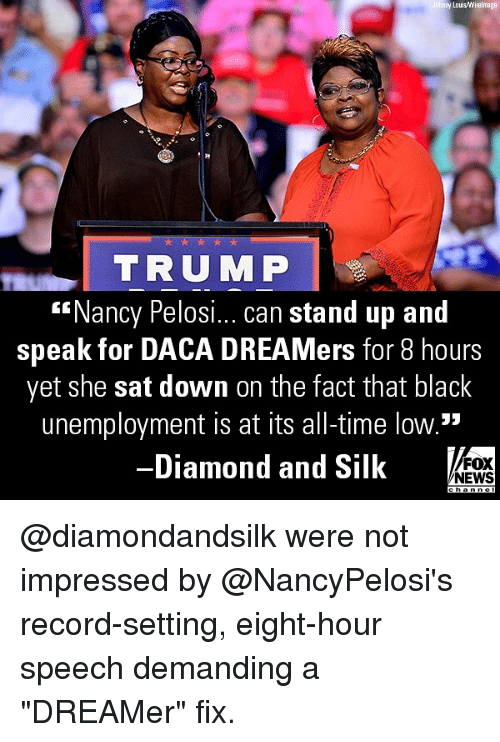 Diamond and Silk FOX NEWS @diamondandsilk were not impressed by @NancyPelosi's record-setting, eight-hour speech demanding a "DREAMer" fix. @diamondandsilk were not impressed by @NancyPelosi's record-setting, eight-hour speech demanding a "DREAMer" fix. Time, Trump, and Strong: Any deal on DACA that does not include STRONG border security and the desperately needed WALL is a total waste of time. March 5th is rapidly approaching and the Dems seem not to care about DACA. Make a deal! Donald J. Trump @realDonald Trump Any deal on DACA that does not include STRONG border security and the desperately needed WALL is a total waste of time. March 5th is rapidly approaching! 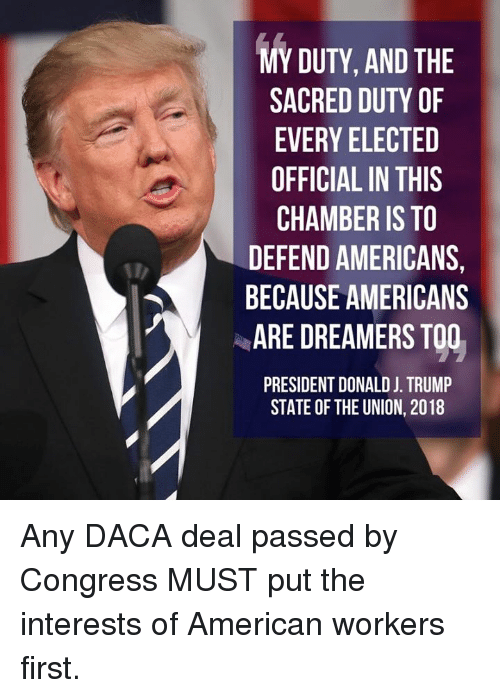 Memes, American, and 🤖: 0 EHT IS T2 TTSIRR ON DL-RE A AN DO THE E TF URRCMDE CE E F H E A E RES STA AVFA EEA 8 Any DACA deal passed by Congress MUST put the interests of American workers first. Any DACA deal passed by Congress MUST put the interests of American workers first.